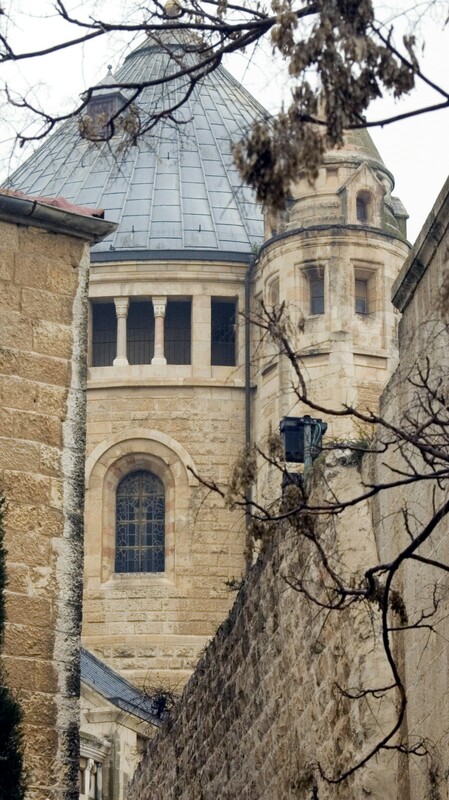 On 3 March 2009, Carol and John embarked on a walking tour of Jerusalem. We were part of a Grand Circle Tours group that visited, Israel, Egypt and Jordan. Upon departing from our bus, we were greeted by a slow drizzle. With cameras and umbrellas in hand we passed by and visited many of Jerusalem's historic sites. The Hagia Maria Sion Abbey was one of these sites. 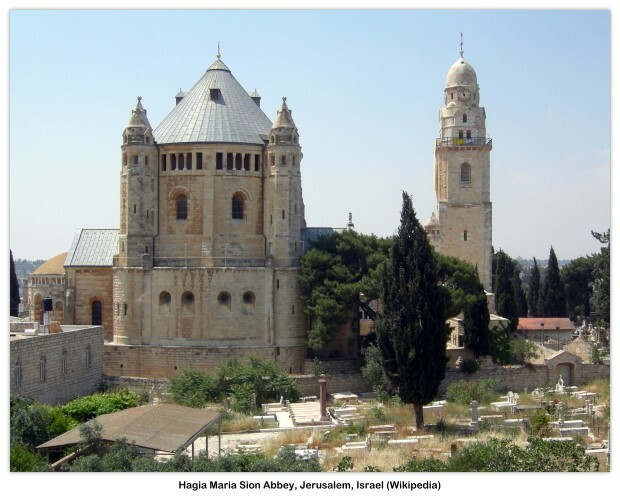 Hagia Maria Sion Abbey is a Benedictine abbey in Jerusalem on Mt. Zion just outside the walls of the Old City near the Zion Gate. 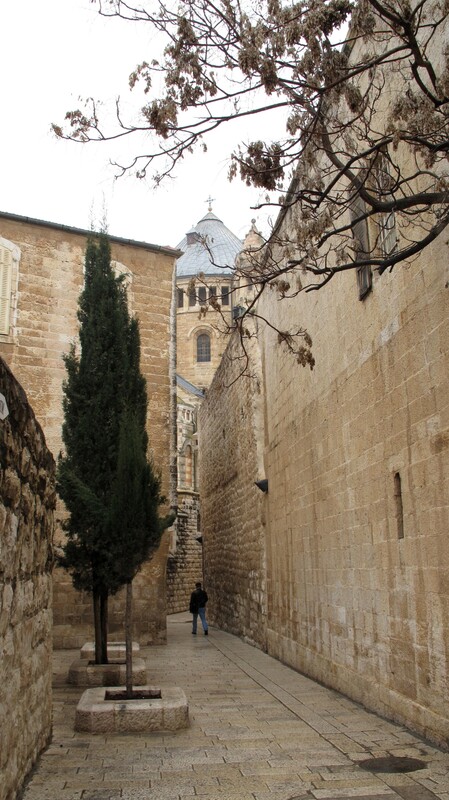 It was formerly known as the Abbey of the Dormition of the Virgin Mary, but the name was changed in 1998 in reference to the church of Hagia Sion that formerly stood on this spot. Site and Building — During his visit to Jerusalem in 1898 for the dedication of the Protestant Church of the Redeemer, Kaiser Wilhelm II bought this piece of land on Mount Zion for 120,000 German Goldmark from Sultan Abdul Hamid II and presented it to the “German Union of the Holy Land” (“Deutscher Verein vom Heiligen Lade”). According to local tradition, it was on this spot, near the site of the Last Supper, that the Blessed Virgin Mary passed into eternity. This gave the original monastery its name; the church itself is called, as it has always been, the Basilica of the Assumption (or Dormition). Exterior of the Church — The architect and buildings manager of the Diocese of Cologne Heinrich Renard (1868–1928) investigated the site in 1899 and discovered the remains of the Byzantine church of “Hagia Sion” and also of other churches. Connected with this is the thesis of Bargil Pixner of a pre-Crusader Church of Zion, Jerusalem. Direction of construction was entrusted to the architect Theodor Sandel, a member of the Temple Society and a resident of Jerusalem. The foundation stone was laid on 7 October 1900. Construction was completed in only ten years; the basilica was dedicated on 10 April 1910 by the Latin Patriarch of Jerusalem. 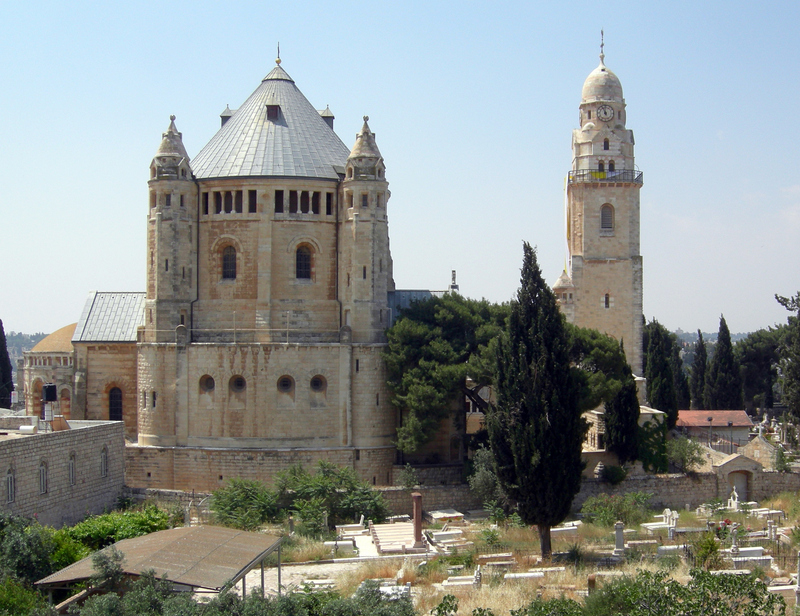 Benedictine Community — The first monks had already been sent to Jerusalem in 1906 from Beuron Archabbey in Germany. They were interned for the first time in 1918-1921, after the end of World War I. In 1926 the monastery was raised to the status of an abbey within the Beuron Congregation. Between 1939 and 1945 the German monks were interned for the second time, and then for the third time as the result of the 1948 Arab-Israeli War. 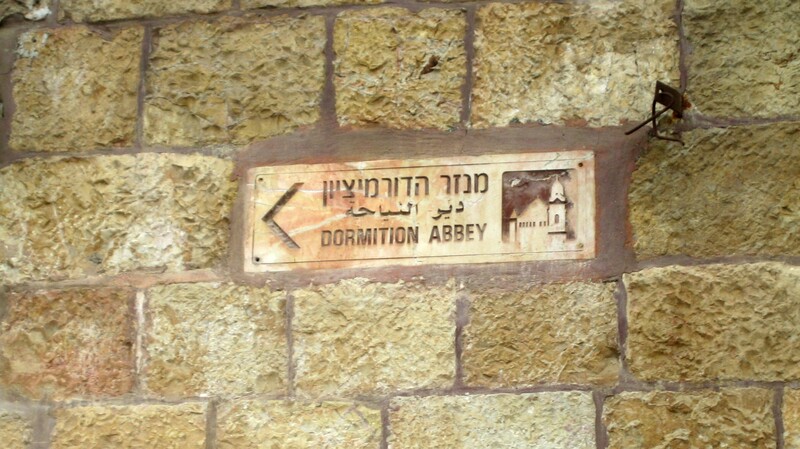 The abbey was located in the no man's land between Israel and Jordan. In 1951 the abbey was separated from the Beuron Congregation and placed under the direct supervision of the Abbot-Primate of the Benedictines in Rome. In 1967 during the Six Days War the abbey came under fire from both sides. Since 1972 a German-language ecumenical "Theological Study Year" has been run in connection with the abbey. The community elected their own Abbot for the first time in 1979. Architecture — The present church is a circular building with several niches containing altars, and a choir. Two spiral staircases lead to the crypt, the site ascribed to the dormition of the Virgin Mary, and also to the organ-loft and the gallery, from where two of the church's four towers are accessible. Out of regard for the nearby Muslim sacred place of Nabi Da'ud, which now occupies the building in the Upper Room where traditionally the Last Supper took place, the bell-tower is set far enough away that its shadow does not touch Nebi Da'ud, and is therefore not directly accessible from the church. 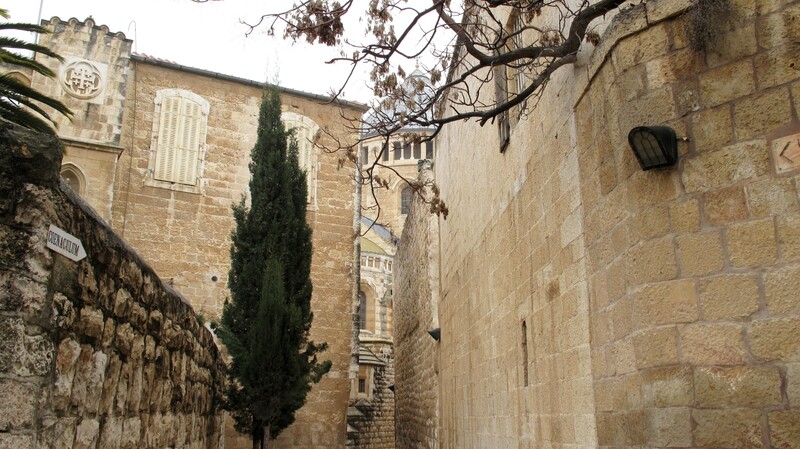 This concludes our walk-by visit to Hagia Maria Sion Abbey located in Jerusalem, Israel. To learn more about the Hagia Maria Sion Abbey, visit the Wikipedia site noted below. Please remember that the photos used on this webpage are copyrighted © by Skytamer Images, and are for your personal use only. 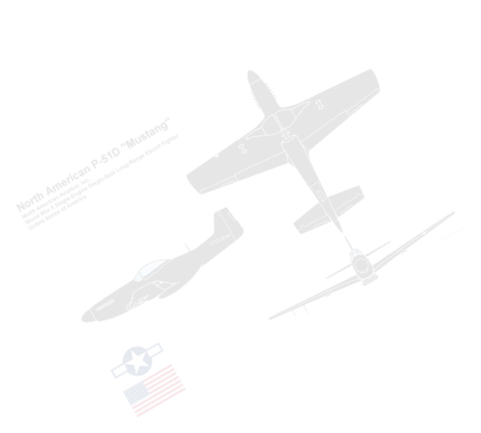 Commercial use of these images requires written permission from Skytamer Images.